I promised myself when I started this blog that I would only post when I felt like it and not let it become something which I felt I *had* to do. Bit busy with Wimbledon, work and wedding season at the moment, so it may just be mainly picture posts for a while. 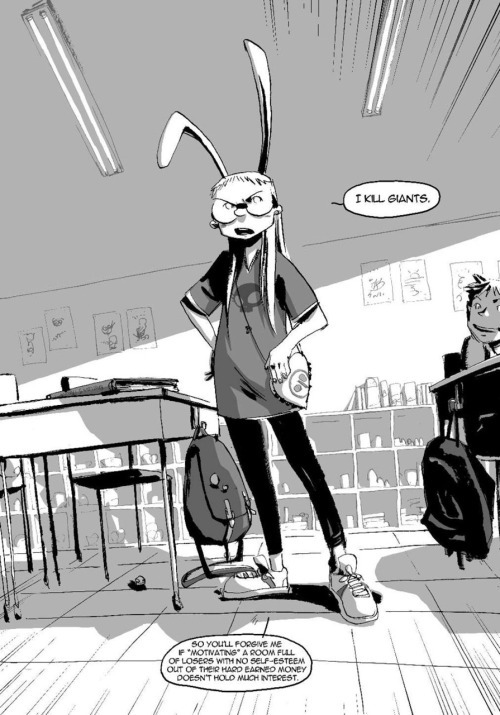 I have to share this short review of I Kill Giants though, as it's absolutely brilliant. I bought this book as it has been rated excellent on Amazon -nine 5* reviews- and after reading through them I was persuaded to buy it. The story centres around Barbara, an 11 year old girl who kills giants. Barbara has a giant-killing hammer called Coveleski and is preparing herself for the upcoming giant invasion. The problem is nobody apart from Barbara can see the giants- are they a fantasy woven from her imagination as her family and schoomates think, or is there something deeper at play? This is an excellent example of a book that successfully strides the adult/child audience. I'm not a prude or anything, but it's a bit of a pet peeve of mine when books which are clealry targeted towards children are just obviously not suitable for them. This comic manages to be intelligent, interesting and entertaining whilst simultaneously dealing with some grown-up (for want of a better word) themes. I would have no qualms about giving it to a child to read. The art is in black and white and while I will always prefer colour comics- for me one of the defining characterstics of comics is to have pictures in colour, I am now able to appreciate some black and white comics also (abhor the woodcut style though). The best compliment I can give this book is that it is quite similar to Pan's Labyrinth in that it straddles the line between fantasy and reality, but is not as dark in tone. Highly recommended.